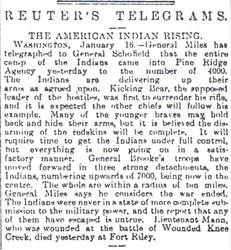 WASHINGTON, January 16.— General Miles has telegraphed to General Schofield that the entire camp of the Indians came into Pine Ridge Agency yesterday to the number of 4000. The Indians are delivering up their arms as agreed upon. 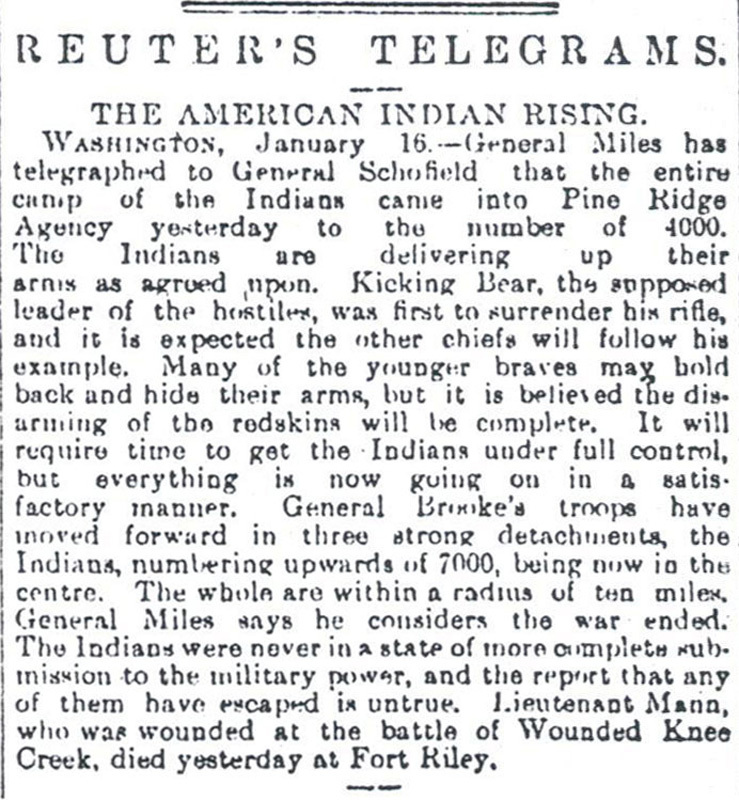 Kicking Bear, the supposed leader of the hostiles, was first to surrender his rifle, and it is expected the other chiefs will follow his example. Many of the younger braves may hold back and hide their arms, but it is believed the disarming of the redskins will be complete. It will require time to get the Indians under full control, but everything is now going on in a satisfactory manner. General Brooke's troops have moved forward in three strong detachments, the Indians, numbering upwards of 7000, being now in the centre. The whole are within a radius of ten miles. General Miles says he considers the war ended. The Indians were never in a state of more complete submission to the military power, and the report that any of them have escaped is untrue. Lieutenant Mann, who was wounded at the battle of Wounded Knee Creek, died yesterday at Fort Riley.